As surely any boxing fan knows, the great, the incomparable, the immortal Muhammad Ali would have celebrated his 75th birthday today, January 17, 2017. Sadly, as everyone does know, The Greatest left us in June of last year. What Ali left behind is far, far more than a legacy as the finest heavyweight boxer of all time. Ali meant so much to so many people; from a political standpoint, to a sporting standpoint, to a racial standpoint and more. George Foreman perhaps said it best years ago, when he said that everybody, from any walk of life, was “lifted up a notch” when they met Ali. But speaking from a boxing standpoint only, Ali thrilled fans and gave a piece of himself in a manner that will never be repeated. Ali fought in a different era of course, when the sport was vastly different. Fighters fought more often, they could never have dreamed of the luxury of “cherry picking” the way fans have to watch the best fighters of today do and the paydays were nowhere near as monstrous as they often are now. If a fighter of Ali’s exceptional talents – talents in the ring, outside of it and from a self promotional standpoint – was around today, it’s likely he would never lose (see Floyd Mayweather; a great fighter, but one who benefited greatly from being able to do things his way: as in fight whoever he wanted to and avoid whoever he wanted to). In short, Ali fought absolutely everyone he should have, as well as plenty of fighters he never had to face. Cherry picking was never even an option in Ali’s day. Consider how fighters had things tougher in Ali’s day: Ali returned, after over three-and-a-half years of enforced inactivity, in 1970; searching for a chance to regain the world champion status he never lost in the ring. Today, such a giant would have had at least two “warm-up” fights against soft opposition, then he might have fought a fringe contender, then a top-10 guy and then, picking and choosing from the three generally accepted “world” titles that were available, he would have gone for the weakest claimant of one. Ali? He had to face Jerry Quarry (a world champ today for sure) and then, a mere seven weeks later, the murderously strong and unorthodox Oscar Bonavena (the last, and I mean, the LAST heavyweight a skilled boxer who was attempting to re-tune his skills would have picked to do so against). And after these two rough, tough and dangerous contenders had been dealt with, Ali met “Smokin’” Joe – just over four months after returning from his enforced exile. No wonder Ali lost to Frazier (but only after a titanic battle; one that left Joe disfigured and beaten up, never to be the same force again.) But Ali, after battling tough and awkward foes such as Norton (twice) and Frazier again, rose to the very top once again, his crown regained with that stunning win over Foreman in 1974. Would such a comeback be possible these days even if there existed a fighter brave enough, hungry enough and great enough to even try it? It’s doubtful. Ali’s greatest accomplishment, in the ring, is his overcoming adversity. The Greatest never had it easy, and that’s just the way he liked it. 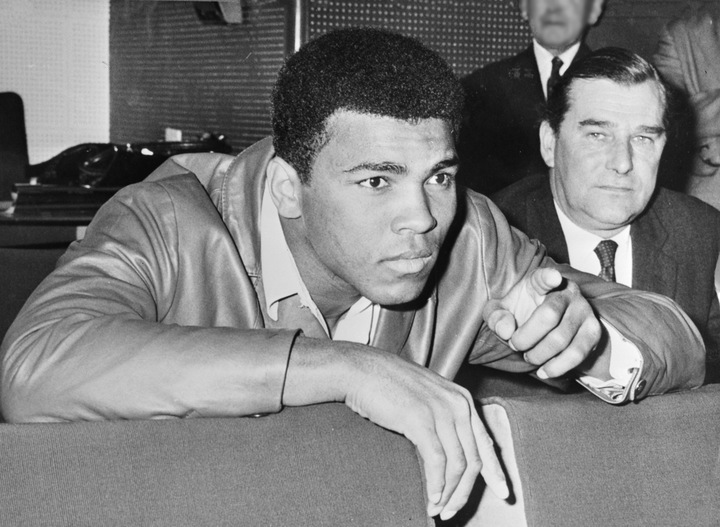 Ali was the best – his unequalled level of quality opposition proves it.